A person might be a native speaker in a language, but this does not necessarily mean that this person will render a high-caliber translation of a particular text. While native fluency is crucial, it is not the only factor in determining who should translate this text from English to the target language. 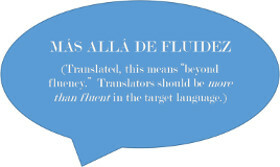 Work with professionals of the target language. If you want a marketing or a training piece translated from English to Spanish, you need a professional and experienced translation agency that has the teams ready to work in such fields. A reputable agency hires not only native speakers of the target language. The responsible agency recruits and attracts professionals that can work as teams to accurately and respectfully translate, edit and proof materials within a deadline and a budget. A reputable agency will be ecstatic to have the best people working for them. So don’t be afraid to ask for references, samples, credentials, or even a resume of the lead translator to ensure that you are in good hands and the translation is worth every penny. By checking this information beforehand, you can ensure that you’ll get the best translation service possible. Is an agency willing to sign a confidentiality or nondisclosure agreements? They should be. Do you have legal documents that need to be translated? Then check with an agency to see if it has translators with a legal background or specialty, and more specifically, experience in a specific legal field. Your translation might not require a specialized background, but if it does, you’ll be happy that you checked in advance. Provide a firm quote without hesitation. You don’t want any surprises, and want to be sure that the project fee fits within your budget. So once you’ve decided on a group of agencies to contact, be sure to have these questions ready to fire away. Galindo Publicidad Inc., by the way, fulfills all five requirements. We would love to learn more about your project to see how we can best assist you in communicating your message to an emerging market or a domestic community in a multilingual world. Click here to learn about our list of certified translation services..